Scrapbook Challenges is having a great blog hop this weekend. 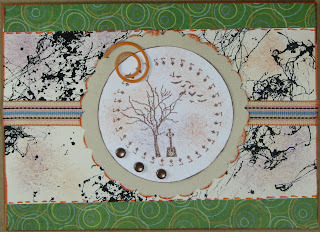 Start the DT blog hop at Pamela's blog. If you want to join in, post a link to this Hop On board to view the members blogs. See details at any of the above links for everything else you are supposed to do and for all of the yummy prizes you could win!!!! Thanks for stopping by! Comments are loved! Followers, too! Joni had a challenge to make these cute little pocket treat holders just in time for Halloween! 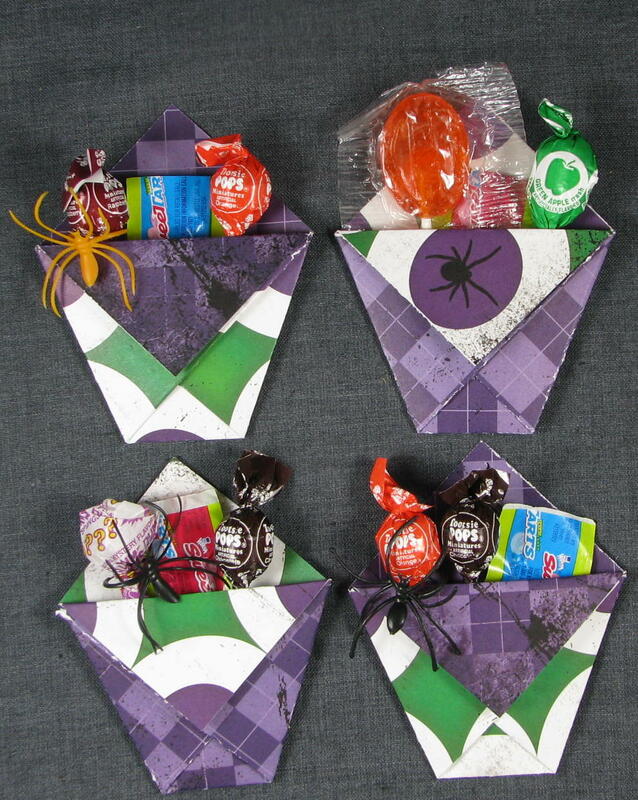 So, I combined this with Design Dollies (top photo) color challenge this week to make these little pockets for special trick-or-treaters! I made it out of Nikki Sivils. As you can see, it was hard to stop! 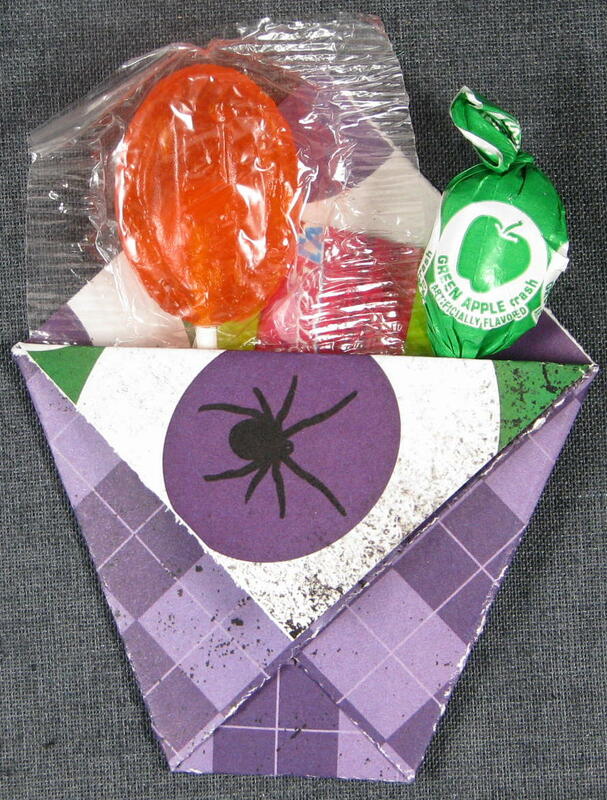 I made 4 Halloween treats and one Christmas treat holder (Cosmo Cricket Togetherness). I used a crimper on the flap on this one. I'll probably end up making more, but I wanted to go ahead and make a blog entry about it! 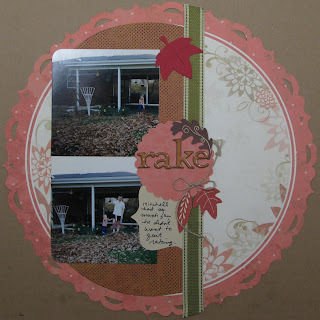 I made this a while ago, but I just hadn't posted it to the blog yet. It is mostly Crate Paper. My son and his girlfriend were reading to our nephew (Mitch's cousin)! He just loved it!! I was pretty happy with this layout. I'm not sure why I hadn't posted it yet. I got WAY TOO involved with a huge sketch-a-thon last month, and I think I'm still worn out from it! I hope you enjoy! Just to let you know, every time I receive a happy comment it makes me smile! I made this little Halloween treat bag for The Paper Variety's challenge this week to "grab some of your favorite candies for inspiration and show us your 'sweet' ideas". It is so easy. Take a sealed business sized envelope, cut off around 3 inches from the top. Then, from the large piece cut off about 1/2". Stamp both pieces all over. Then, crimp the long side. Place a regular sized candy bar and/or whatever you can fit in it. Place the 3" top over that, and there you have it! Easy peasy! 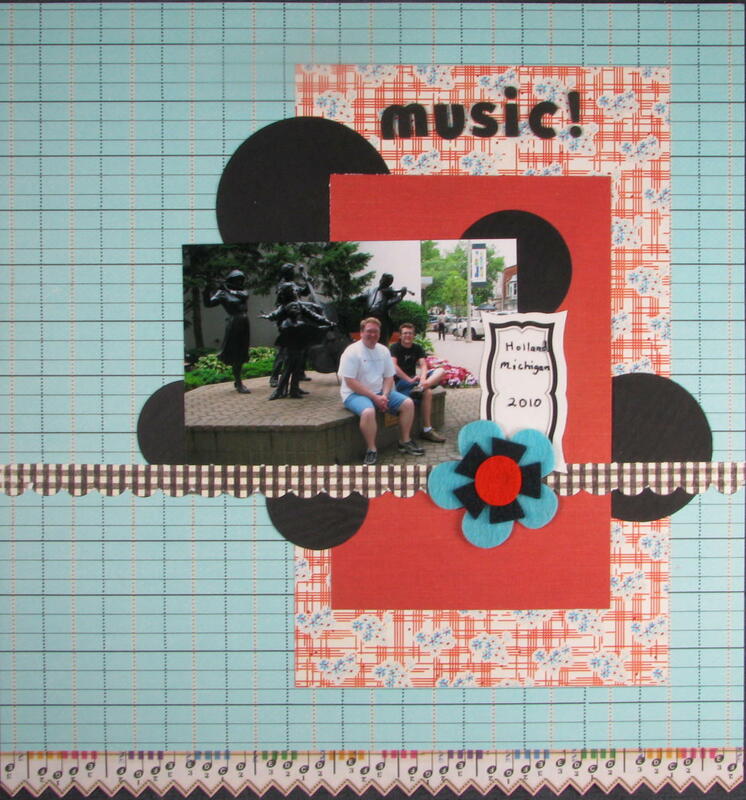 I made this layout of Mitch and Steve in Holland, Michigan, while we were there on our summer vacation this year. The statues were all over the town. They are playing music here. Real music came from speakers on this one. I made this from a sketch by Julie Bonner. The Sassasfras Las came from my friend Stacy HW. 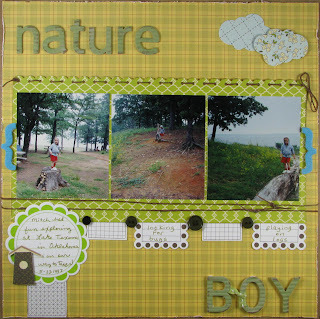 I made this layout for Artful Delight's sketch challenge #1! All is Crate Paper except the letters which are American Crafts Thickers! Head over quickly if you want to participate in the challenge! 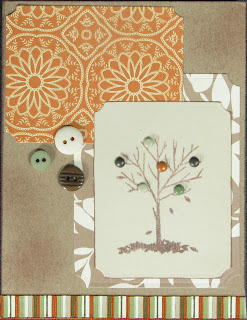 Leanne gives wonderful prizes, and she has free shipping in her shop in October! She has some great kits and things that are unique to her shop. 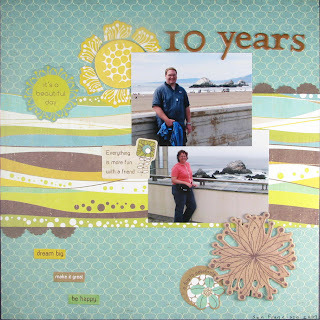 I made this using Sketch Inspiration's Sketch #146 for Scrapfit's Workout #30 challenge to use lime green, orange, purple and black. 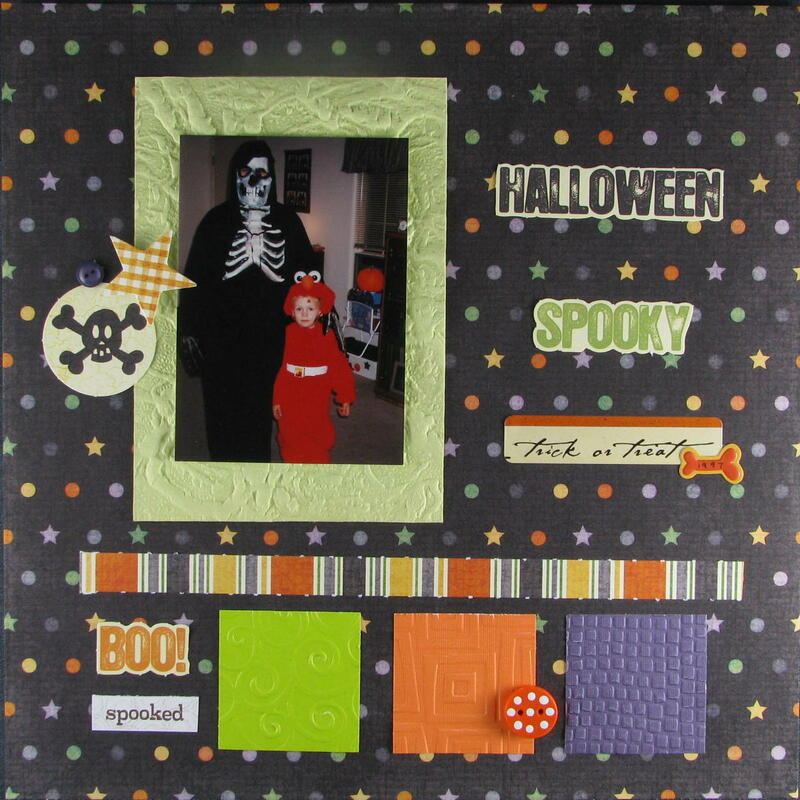 I used cardstock in the squares. 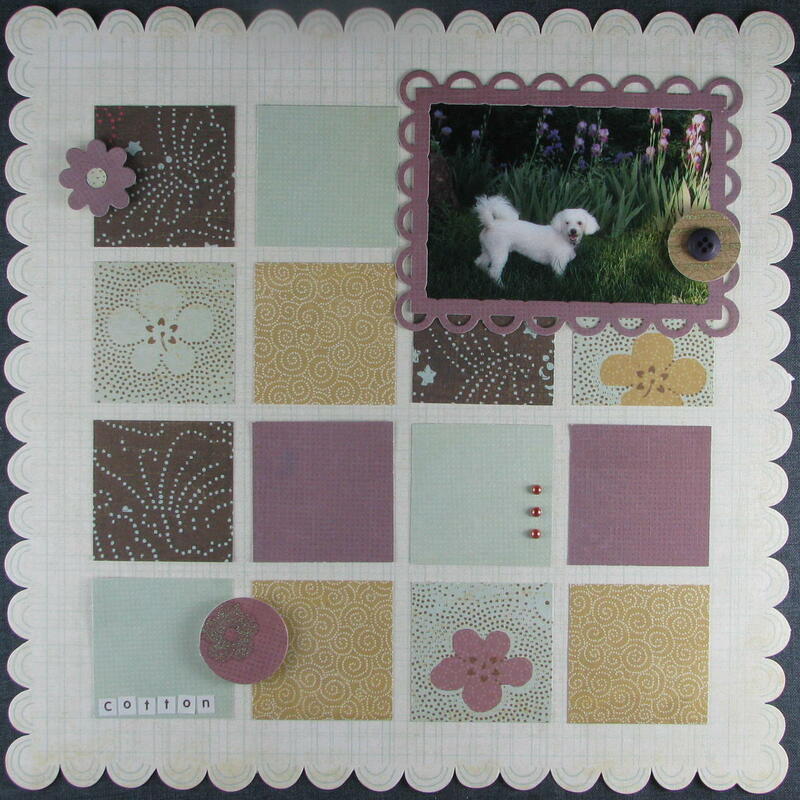 I decided to emboss all of the squares with different Cuttlebug folders. 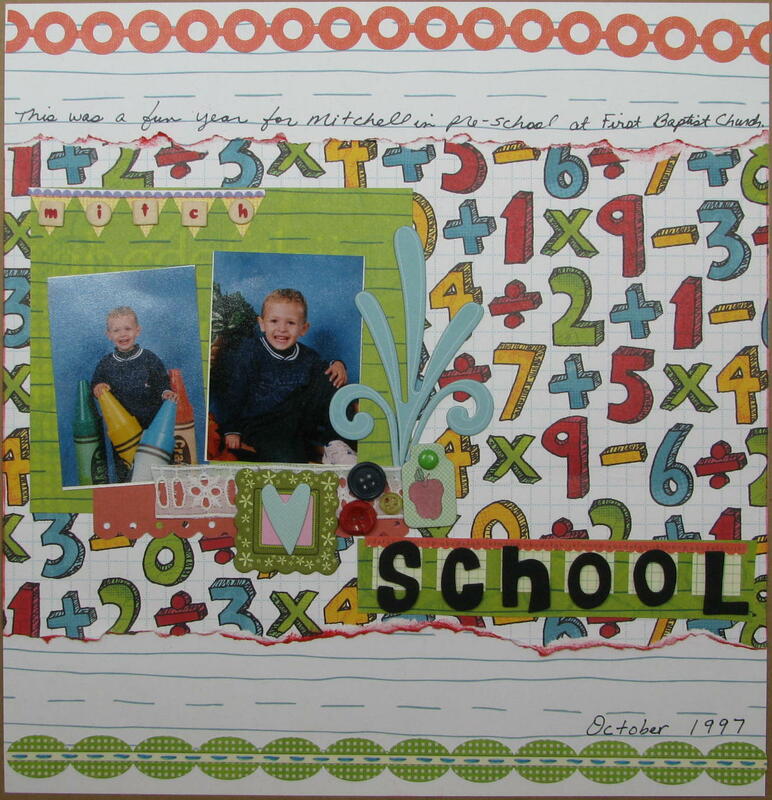 The green paper under the photo is some very textured I bought from Sizzix many years ago. The pp and tags are MME (from Stacy HW/Val). 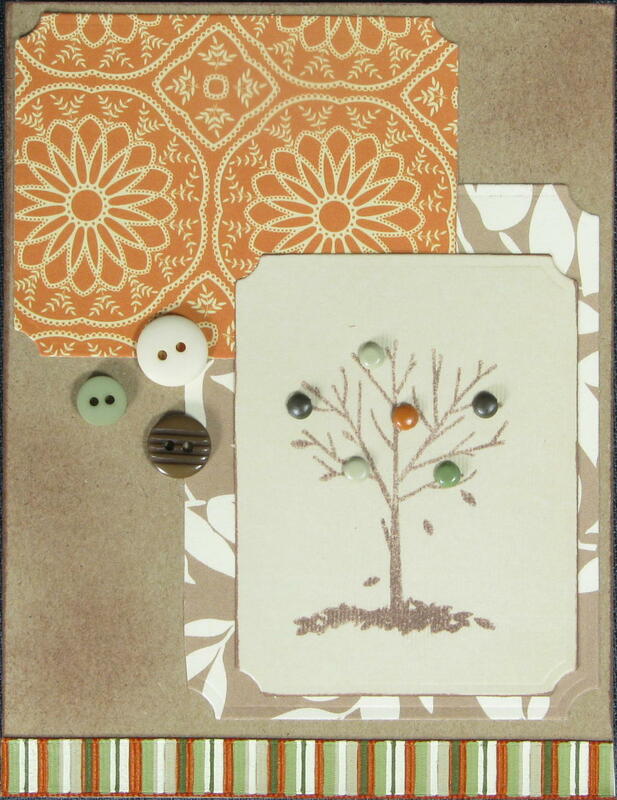 That fun orange and white-polka dotted button was given to me by Kristy from Buttons and Bows. I made this for *These are a Few of My Favorite Pets* :):):):):):):):):):):):):):):):):):):):):):) using a Crate Paper sketch! It is mostly Mia. I used Helmar zap dots to add a little dimension to the cirlces. The pearls and tiny letters are Kaisercraft. I am entering this into some challenges. I got some concepts from Simon Says Challenge: What's Cookin' Good Lookin'? 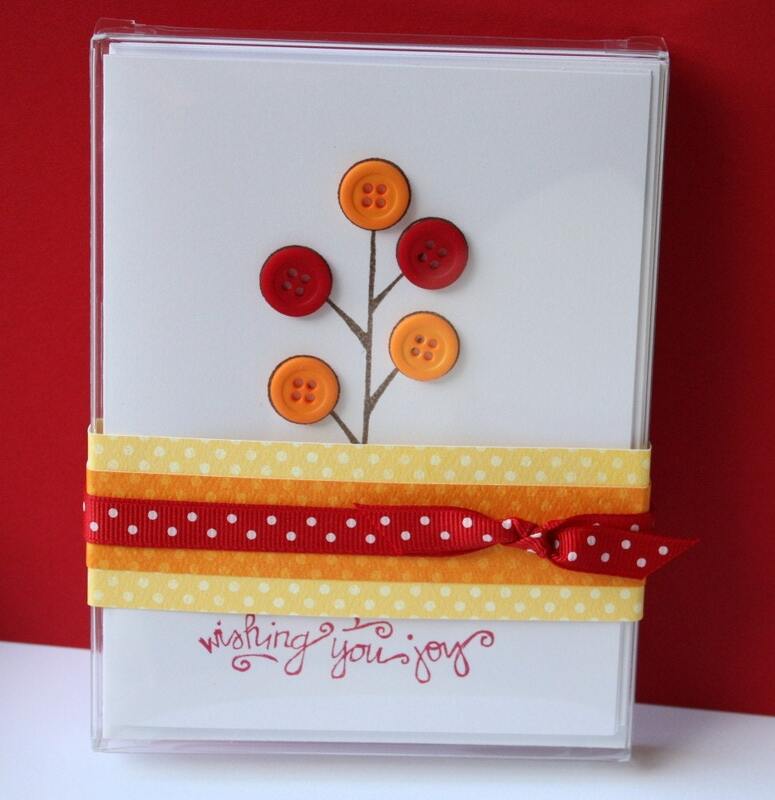 challenge to add these ingredients together: 3 Types of Embellishments (I used brads, buttons and ribbon); 2 Patterned papers (and a plain colour for layering if you like); 1 Image. 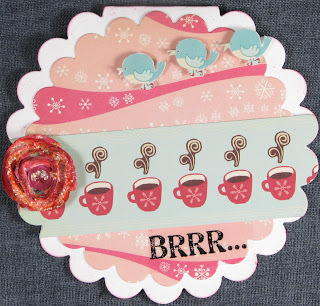 You could create any card for http://craftski.multiply.com/journal. I made this little treat box for Inking It Up Crazy's challenge to alter a random item and make it something special. I took an old box and freshened it up by adding some Halloween paper, ribbon and a CTMH Dracula stamp on an inverted circle Spellbinder die. 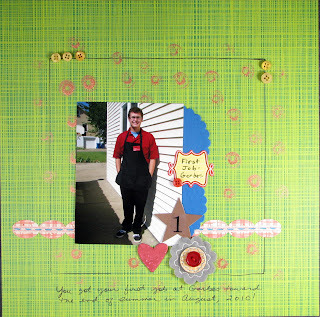 Here's another layout that I made during the big Sketch A Thon at Sketches 4 All during September. I guess Mitch was 5 1/2 then. Wow, time has flown! These pictures were taken pre-digital in October of 1999. 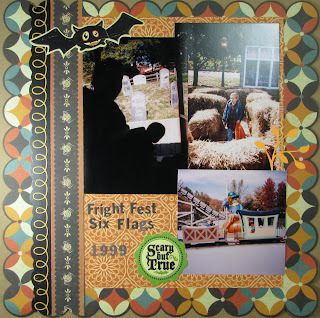 I may not have chosen to print the one on the left, but it's kind of cool that the boys are like a silhouette and you can see the creepy "tombstones" in the background. We were on the train there. 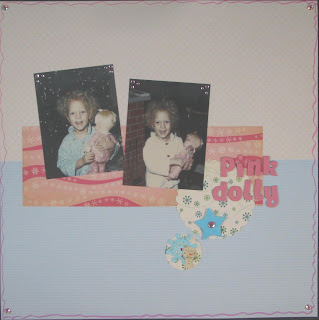 My sister and I got "pink dollies with a string" in 1968 for Christmas--or at least that's what we called them! I actually can't remember the real name of the dolls. All I know is that We were so excited!!!! 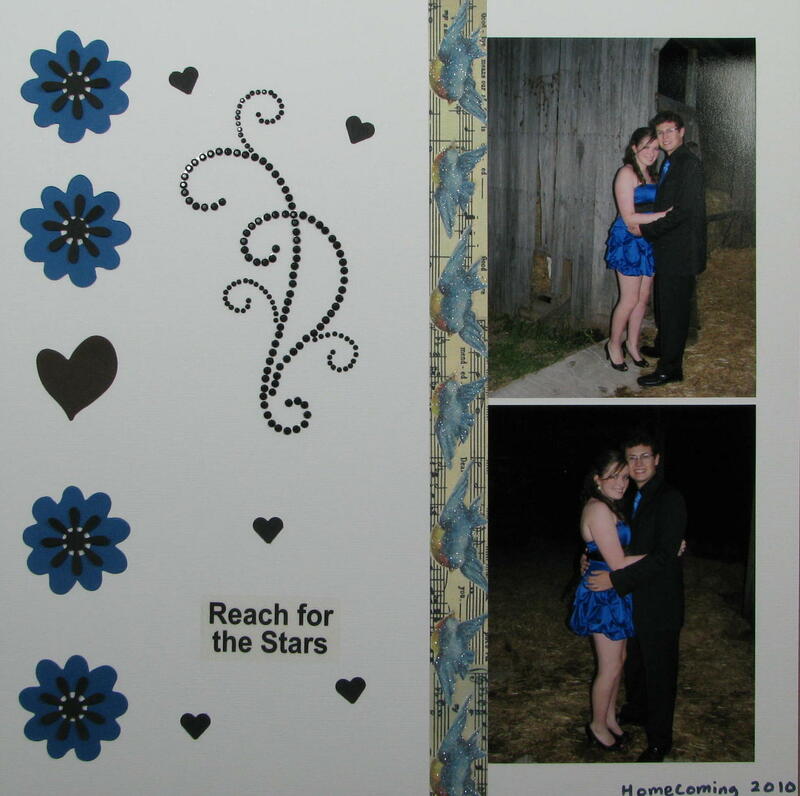 The pictures are old so they have a "faded" appearance. But, you can tell we had so much fun with our dolls! I made this along with the bookmark and card as part of the TRIFECTA for the Design Dollies challenges this week! I used Cosmo Cricket's Jolly by Golly on all 3 projects--the snowman and the pink snowflake papers went on all three! I used a lot of jewels on the layout to brighten up the photos! 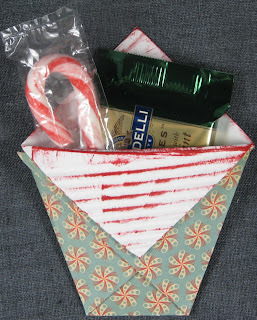 I used American Crafts fabric Thickers for the letters! 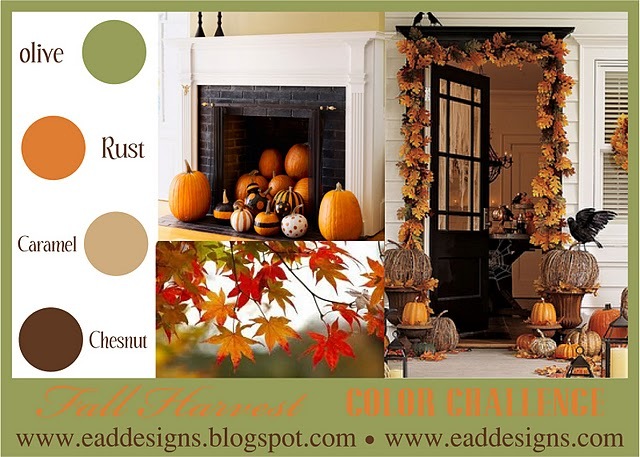 Your challenge (should you choose to accept it) is to create a THEMED project... That means a minimum or two or three matching pieces... I did 3. 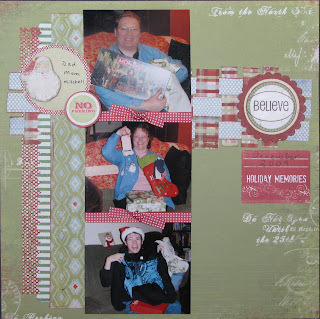 I made this layout mostly using My Mind's Eye "The Merry Days of Christmas" that I recently got from my friend Stacy HW. Her challenge this week was to use weaving on your layout! I used Sketchy Thursday's current sketch to complete the layout! 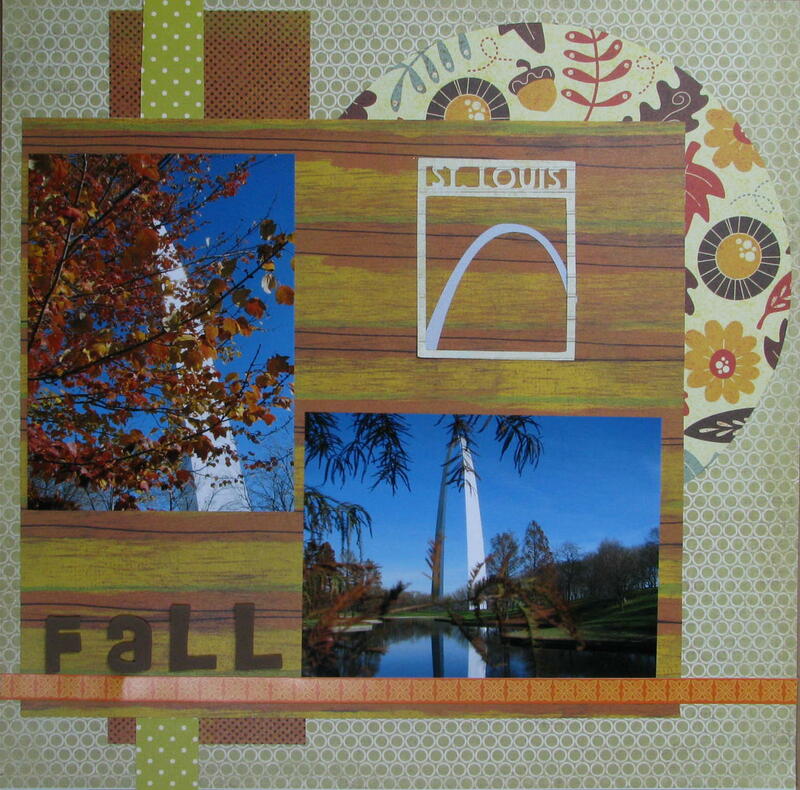 My Scrapbook Nook is having a Jillibean Soup contest. 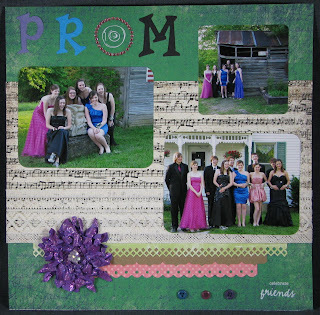 This layout is almost entirely Jillibean Soup! This was my little guy many years ago. He always loved to explore every bit of wherever we would travel. He loved looking for bugs and other stuff! I can't believe he is 16 now. It just seems like yesterday when these pictures were taken! I made this with a kit I bought from Timeless Daydreams and a few pieces I won from Lucky Girl Crafts for Scrap Whispers. Our team didn't win, but it was fun to play. Cosmo Cricket is having a challenge. I created this cute little card for it! 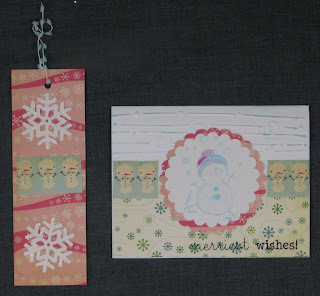 The Pink Stamper has also issued a winter challenge, and I thought this would work well for it also! And, yes the coffee mugs are on a slant and so are the birds. I thought it made it more fun. I fussy cut the little birds because I wanted to have them walk down the dark pink part of the cute patterned paper! 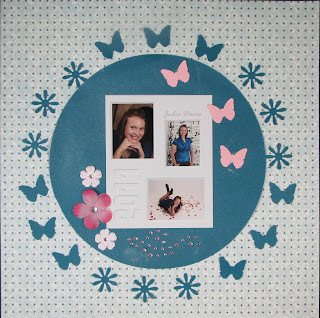 Anyway, I made the little spiral flower and added a pink button, a little ink and Rock Candy stickles on it. The BRRR sticker is SRM stickers! Thanks for looking! You know, sometimes you have it, and sometimes, you don't! This is more in the "don't" category. I don't know why I was so stubborn to keep working on a layout when I was just not "feelin'" it! Well, that's the way it goes sometimes. I just haven't been feeling well this week. Many of you do not know that I have Lupus as well as Sjogren's Syndrome (which is another autoimmune disease), and I also suffer from terrible migraines frequently. This is why I work part-time as an ESL tutor instead of as a full-time librarian! Well, this week I have been in a flair. I had a horrible migraine today, but I wanted to take two of my students to a kite making afternoon about 1/2 hour from where we live. So, early this morning I took my Rx, grabbed my "heart pillow" (heating pad) for my neck, slept in my quiet, dark room until it was time to get ready to go. I did not want to disappoint "the girls." We did get to go, and the girls got to make some beautiful butterfly kites--taught by a master kite maker from China! It was so fun seeing their enjoyment!!! We also took them out to eat. This was a rare treat for them! So, we really enjoyed the day! I'm still feeling badly, but HAPPY! 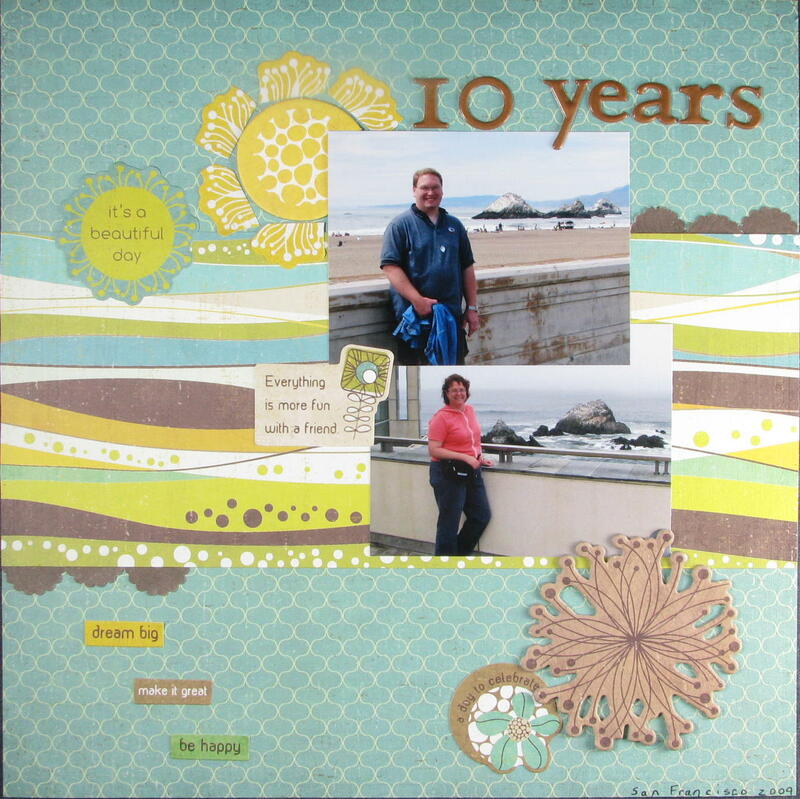 Anyway, back to the layout: The Paper Variety had a challenge where you had to scraplift one of their DT members. I decided to use elements from Tessa's layout! They are the cluster with the heart, star and flower to the lower right of the photo. 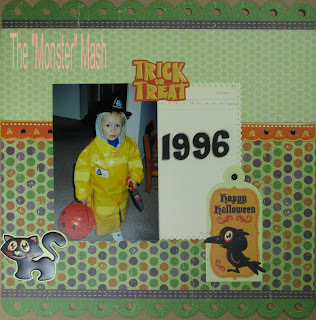 I also drew a box around the photo as a frame and added some buttons in a couple of clusters. 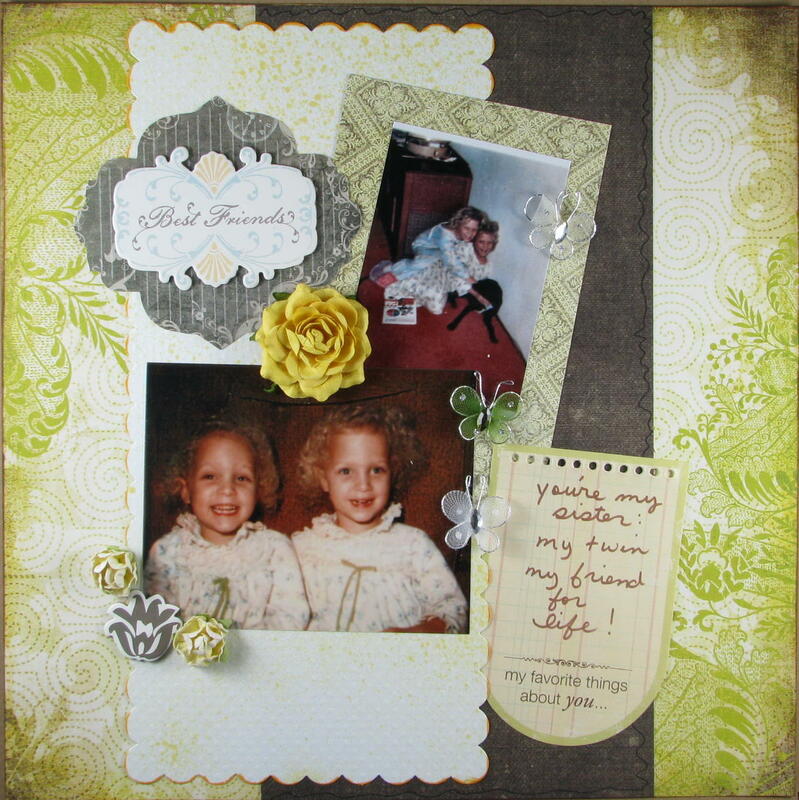 I also added a scallop to the right of the photo--which Tessa also included in her layout! I did use paint, but I used it more like the loosely followed Sketch Inspiration's #144 this week. You can see the sketch in the paint dauber circles and the border strip along the bottom of the photo as well as the little bracketed title "First Job - Gerbes." 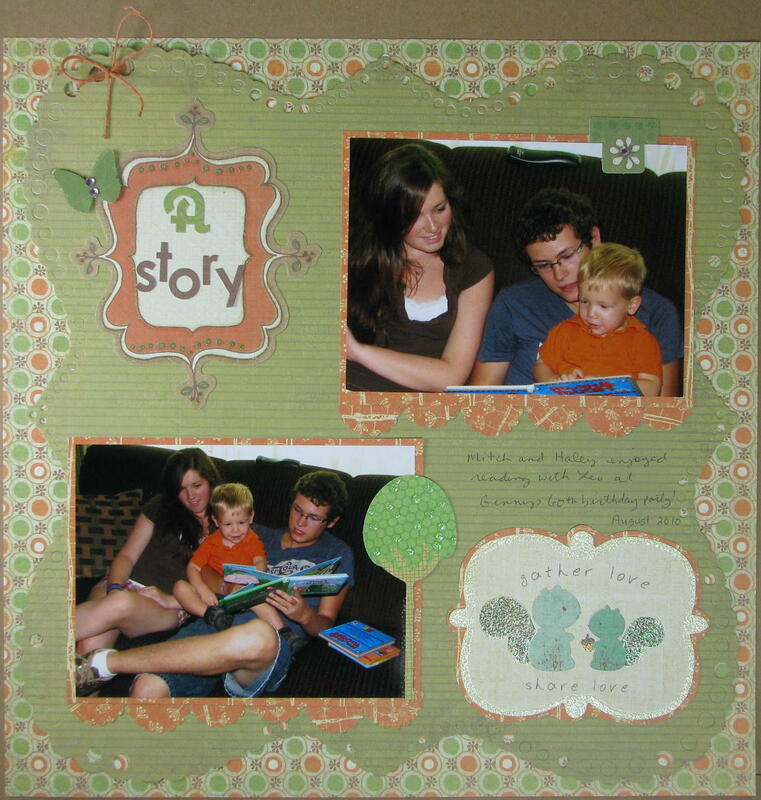 I also took a little inspiration from a CK layout called First Snowfall by Tina. This card is really simple. What I like about it is the Krylon webbing spray on the middle background paper! 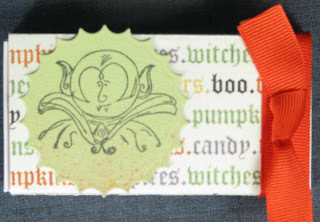 I got the stamp from a friend at Sketches 4 All and the sketch came from there, too! 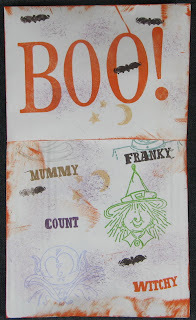 I'm entering it into the Simon Says challenge to make a Halloween Card. 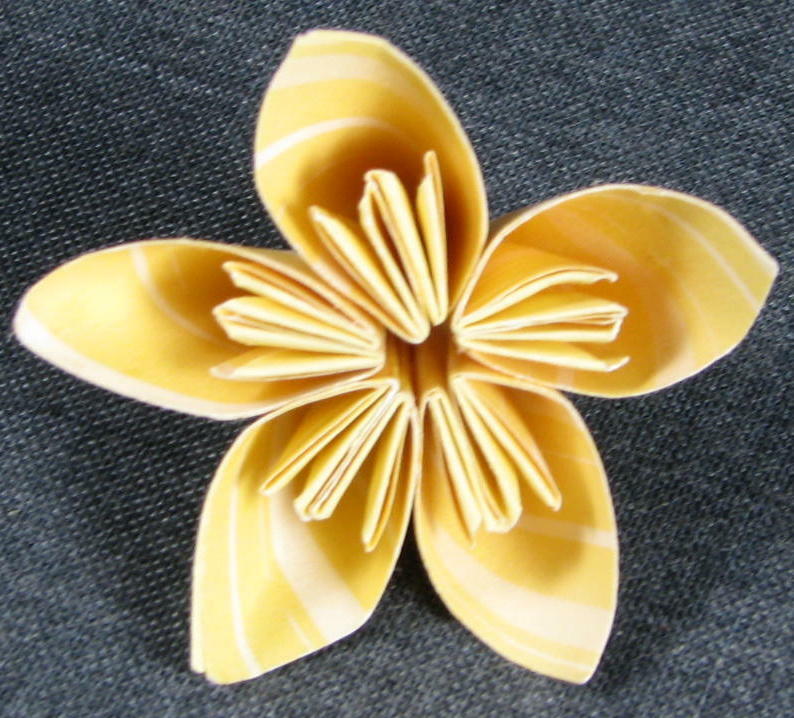 I made this flower using a tutorial from Sandy Ang. I made some with the Chinese girls who I tutor at the local high school. They caught on immediately. I didn't have my camera with me, but I am sharing the one I made. I gave them much prettier paper! They just loved doing it! So, I wanted to thank Sandy for sharing the wonderful tutorial. 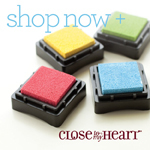 If you have a minute, you might go over to Sandy's site. She is really talented! She also sent me a fantastic card, but I didn't take a photo of it! I've been exhausted this week so I've only done 2 crafting projects this week. Most everything I'm posting are things that I made for the Sketch A Thon at Sketches 4 All last month! My husband is gearing up for fall shows--which of course, means that I am going to be extra busy! Here are some of his latest creations!!! After a break, it looks like XOXO is back. Hey, wouldn't you like to scrap-lift this layout to win a prize? Go to The XOXO challenge site for details. 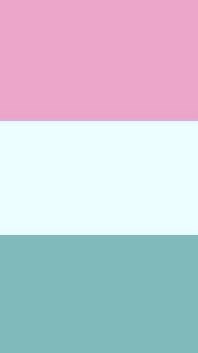 My term was up in August, but since the site was static for a few months, the challenge was postponed until now! This is a layout for ScrapFit's challenge to use a halloween song title. I chose The Monster Mash! I created this for the Scrap Room and Sketches 4 All. The bling is ZVA. I pop-dotted the black flower over the blue flowers! I thought I'd keep this one simple! 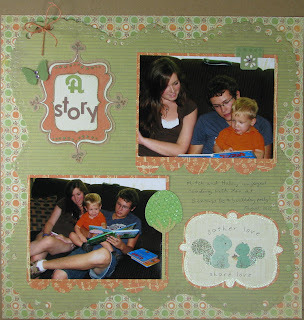 I used a sketch from Sketches 4 All to make this layout. I think it meets the current Simon Says Challenge, but I saw mostly cards there and have never entered a challenge there.